Warframe’s upcoming expansion Fortuna is centered around a forced labor colony on Venus, and in the surrounding open world that comes with it, you’ll be able to track, tranquilize, and capture various creatures to protect them from the pending climate disaster brought on by the Corpus use of Venus’s ancient terraforming machines. Digital Extremes gave us a peek at one of the Venusian animals during Tennocon July 7, and now the company has teased some additional fauna on Twitter. These are concept art images, so the final designs may vary a bit from what we see here, but they do provide at the very least a sense of what the design team has been going for. Warframe doesn’t have to cost you a dime, and neither do these. Here are the best free games on Steam. A creature dubbed the Snow Predator looks a bit less friendly. It has rodent-like teeth that have curled and grown through its head, and has a blubber-covered body and flippers for paws. There are two unnamed concepts, too. 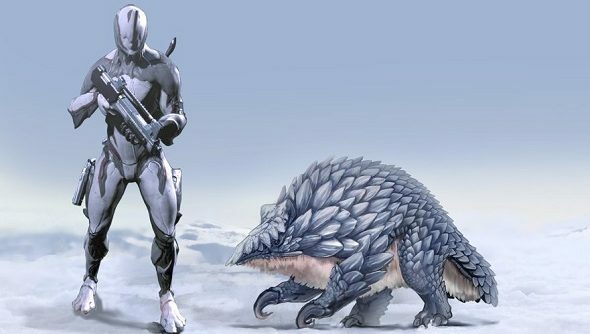 One looks a bit like a snow-adapted jumbo version of an armadillo or pangolin, and has curved paws in front and wood-like scales covering its upper body. The other is a bit more nightmarish, with whorls of wrinkled flesh over its body and spurs of bone on its back and snout. Expect to see these and the rest of Fortuna when it comes out in the fall.